Excavators are the giants of the construction site. They can dig through concrete, transfer building materials, lift objects into the air, and demolish entire structures. It is no wonder, then, that they are a staple for any construction project. When it comes to buying an excavator as an individual or for a business, there are several tips that can help make the process smoother when trying to choose the right machine for the job. In general, the more knowledgeable the buyer, the better their chances are of finding a quality, user-friendly excavator. At the very outset, they should establish their own needs and expectations: this can help them in making many key decisions. Also important is knowledge of the excavator parts, their functions, available options, and product specifications. This way, they can interpret information about different models in a meaningful way, especially if considering a used model. Following these guidelines can help buyers to select an excavator that can get the job done properly. Buyers should keep in mind the jobs that the machine is required for, so they can have a fixed idea of what they need and expect from an excavator before starting the search. First, what type of site do they typically work on? Is it a broad landscape, with plenty of space? Or do they normally work in narrow urban areas between buildings? Next, what kinds of jobs does the excavator need to be able to do? More specifically, how far does it need to reach, how deep should it dig, how high should it lift, and how much should it be able to carry? What functions does it need to perform? Lastly, buyers need to consider factors such as how they will store and transport the excavator once it has been purchased. Clarifying these expectations can help buyers to make the right decisions during the buying process. Cab – Compartment on top of the machine where the operator sits. Can rotate 360 degrees independent of the undercarriage. Engine – Diesel engine delivers power to the tracks and to the hydraulic systems responsible for moving the boom and attachments. Undercarriage – Bottom part of an excavator. Steel or rubber tracks, propelled by sprockets and rollers, are the normal means for moving the vehicle, however, there are also versions on wheels. Boom – Long arm that extends from the main chassis. Connects with a stick which holds an attachment via a joint known as the elbow. Attachment – Performs the excavator’s functions. There are a number of different attachment types, most commonly, a bucket used for digging. 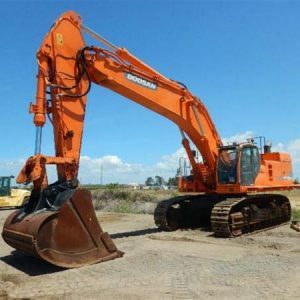 Excavators come in a range of sizes and dimensions, so narrowing down your choices to a specific size range and excavator type will help to save time which searching for a machine. The term ‘mini excavators’ covers the smallest models available, including micro excavators that weigh as little as 800kg or less, mini excavators that average around 3,000kg, and midi versions that are 6 tonnes or above. Mini excavators are ideal for construction jobs in small spaces and other lighter work. Their compact design lets them manoeuvre in confined areas, and they leave minimal damage to the landscape. Zero tail swing excavators are particularly suited to tight working spaces. The counterweight, normally found at the rear of the vehicle, is placed so that it does not swing outside the machine’s track widths. This means the cab can rotate 360 degrees the without risk of it hitting anything nearby. The category of standard excavators covers machines ranging from 10 to 40 tonnes. 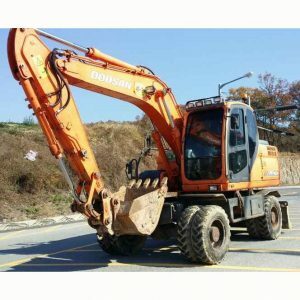 These are usually used for more demanding or larger operations than their smaller counterparts, usually on sites where spatial constraints and landscape damage are less of a concern. Large excavators, generally only used for highly demanding work, weigh between 40 and 70 tonnes. Their sheer bulk makes them impractical for most jobs, but the ideal machines for big, industrial sites. 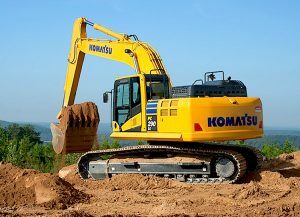 There are a few different types of excavators for buyers can choose from. 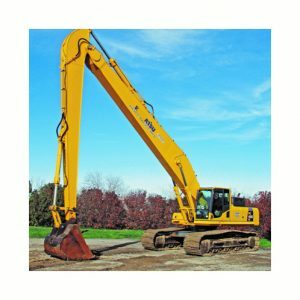 Perhaps the most common are crawler excavators, which feature steel or rubber tracks moved and guided by sprockets and rollers. These provide maximum stability on uneven surfaces. Slightly less common are wheeled excavators, which move on wheels instead of tracks. This gives them more mobility than crawler excavators, especially moving between jobs. Long-reach excavators feature an extra-long boom, allowing them to reach upper levels of buildings. They are often used for demolition, as they can pull structures down in a controlled manner. Optional features can make a big difference in an excavator’s efficiency, versatility, and comfort. After assessing the specific demands of their particular work, buyers should take the time to consider which additional features might help. In addition to the standard bucket, which is good for average jobs, there are many other kinds of attachment. Having multiple attachments on hand means an excavator can perform a variety of tasks, simply by switching the attachment. Heavy-duty buckets and severe-duty buckets are made tough for lifting rocks. There are also specialised buckets for pavement removal. When grading or digging a slope, tilt buckets can adjust their side-to-side angle for optimal performance. Sorting buckets are used to separate large rocks from finer debris. Buckets aside, there are also a number of other attachments, including augers for drilling, thumbs for grasping objects, hydraulic hammers, rakes, mulchers, and rippers. Excavators are built to last: on average, they can operate between 8,000 and 10,000 hours before any major parts need to be replaced. Buying a used excavator , therefore, is a good way to economise while still getting a quality machine. That said, buyers should take certain steps to make sure the used excavator they’re buying is ready to work; if it is not, they should have an idea of the extent and cost of necessary repairs. If buying online, the shopper should carefully inspect photos, which must be of the equipment for sale rather than stock images. Communication between buyer and seller is crucial: if a seller withholds information or does not answer questions, it may be best to walk away. Product specifications give buyers an idea of how powerful an excavator is, and also help them gauge whether it is the machine for their needs. Some of the basic specifications are explained below. Weight – Expressed in metric tonnes or kilograms (kg); gross weight is the maximum operating weight including operator and equipment. Dimensions – Important dimensions include length, height, track width, width of cab, ground clearance, and reach (the maximum length which the boom can reach). These are important to know when considering how to transport the machine. Engine Power – Normally expressed in kilowatts (kW). Stroke – Total distance a piston moves upwards or downwards in engine cylinder; stroke-to-bore ratio is also connected to engine power and efficiency. Number of Cylinders – Indicates the number of cylinders in the engine; another factor contributing to power. Dig Depth – Indicates the maximum depth the excavator can dig; normally expressed in millimetres. Specifications help give the buyer a better sense of how an excavator will perform and some can often be deciding factors when it is time to choose which model is best suited to the job. Buyers get the most out of their excavator when it is user-friendly and reliable: ready for long stretches of work, and easy to operate for maximum productivity. If shopping for an excavator in person, buyers should test out the different machines they are considering. If not planning to run the machine themselves, they should ideally bring along the person who is going to be using it. If buying online, shoppers should research user reviews for that model and ideally get to know more about the manufacturer. Possible sources of information include trade magazines, online forums, and experienced professionals. An ergonomic design gives the operator comfort and control, with everything within reach. The seat should be adjustable and getting into and out of the cab should be easy. Visibility should be excellent, both for trench work and driving. Another benefit is uncomplicated access to the engine and hydraulic systems to perform basic preventative maintenance. Finally, buyers should research the reliability and power of a particular model, so they have an idea of what to expect from their chosen machine. Whether you’re looking for a new or used construction excavator, micro, mini, or standard, you can find a large selection of affordable options on our stock list. You are welcome to take look at our eBay feedback profile and read comments left from previous customers who have bought machines from us. We will always take the time to discuss your requirements and will welcome your visit to try out different machines before commuting to a purchase. We take pride in ensuring that we only sell our customers machines that they will be satisfied with, so give us a call today on 01303 844447 to discuss your needs.